A charity that works to inspire children into hi-tech jobs has thanked Surrey County Council for 30 years of support. Since it was set up in 1984, Satro has organised interactive academic challenges for over 450,000 schoolchildren to encourage them to follow careers in engineering, technology, science and maths. 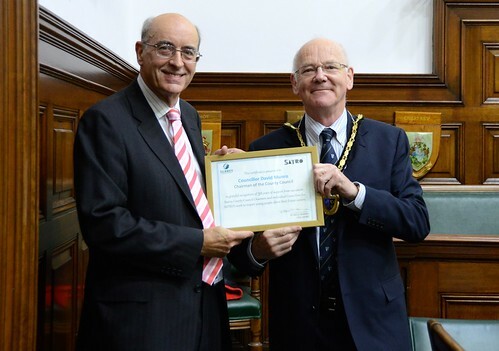 At the Full Council meeting on 14 October, Satro chairman James Dubois handed a thank you certificate to council chairman David Munro for the council’s financial help to set up events. Surrey’s Walton Bridge has won its third gong this year after scooping an award celebrating the cream of the construction industry. The bridge, which was the first new Thames crossing in 20 years when it opened in summer 2013, picked up the Best Practice Award at the British Construction Industry Awards on Wednesday 8 October. Built for the county council on time and on budget by contractors Atkins and Costain, Walton Bridge carries more than 35,000 vehicles a day between Shepperton and Walton-on-Thames, and the latest accolade comes after two awards in June from the Institution of Civil Engineers. John Furey, the county council’s Cabinet Member for Highways, praised Walton Bridge project supervisor James Young when he announced the award to Full Council on Tuesday 14 October. Wines from five Surrey vineyards will be sampled at a unique wine tasting evening in aid of Guildford Cathedral’s ‘Make Your Mark’ appeal in November. Chairman of Surrey County Council, David Munro, is organising the evening when fifteen local wines from sparkling white to red will be tasted at the new headquarters of the World Wildlife Fund (WWF) in Woking. The wines will come from the Blackdown Ridge Vineyard, Haslemere, Denbies Vineyard, Dorking, High Clandon Vineyard, East Clandon, Greyfriars Vineyard, Hogs Back and Painshill Vineyard, Cobham. The tasting will take place from 6.30 to 8.30pm on Thursday 6 November at World Wildlife Fund HQ, Brewery Road, Woking GU21 4LL. Tickets cost £25 each, to include canapés and wine, and can be purchased from Chairman’s Office, Surrey County Council, Penrhyn Road, Kingston-upon-Thames KT1 2DN, 0208 541 9031 or email chairmans.office@surreycc.gov.uk. The Surrey Heritage Showcase will take place on Saturday 25 October at Chertsey Hall, Heriot Road, Chertsey (noon to 4pm) with a focus on Chertsey, Addlestone, Ottershaw, Lyne, and Longcross. It will be the third Heritage Showcase in the county organised by Surrey Heritage, part of Surrey County Council. The event brings together experts from the Surrey History Centre and local organisations and societies to showcase the history and heritage of an area. There will be ‘Ask the Expert’ sessions where Surrey Heritage’s archive conservator and the county’s Finds Liaison Officer will be on hand to give free, practical, professional advice on preserving and identifying books, letters, documents, maps and photographs. Family history experts will also be available to help trace ancestors. For more information, visit the council website or phone 01483 518737. One hundred Surrey women are being offered the chance to become digital entrepreneurs so they can set up new businesses or transform existing ones. Surrey County Council has secured funding from the Women and Broadband Challenge Fund to train 10 women as digital coaches, who will each in turn train 10 more women to boost their digital skills and help grow Surrey’s economy. The initiative is known as Surrey Wise (Women in the Superfast Economy). For more information, contact Hannah Power at enquiries@surreywise.co.uk or call 07795 388265.